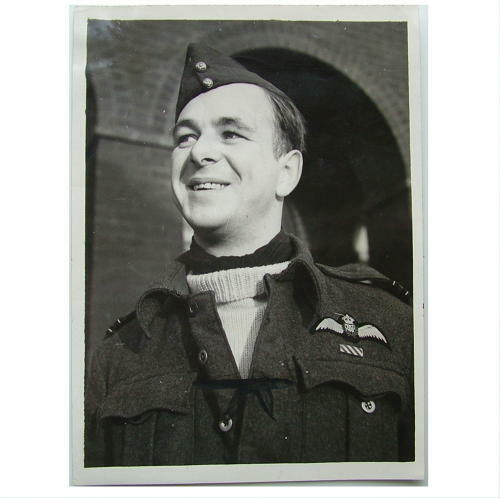 British official photograph of Acting Squadron Leader George Wightman Gilpin. Approximately 20 x 15cm (8 x 6"). Captioned to rear ' Gilpin, who has been awarded bar to his DFC, No. 61 Squadron. Since the award of the Distinguished Flying Cross, this officer has taken part in numerous operational sorties. He is one of the squadron's most successful pilots and has displayed consistent courage and tenacity in seeking out and attacking his targets. Squadron Leader Gilpin's fine leadership and the excellent co-operation of his crew has enabled him to drive off night fighters on four occasions. On one of his missions, his aircraft was attacked twice by single fighters and later by two enemy aircraft working together. His control of the aircraft was such that his gunners were able to engage the enemy and one fighter dived away with black smoke pouring from it. In spite of a fire in his own aircraft caused by a cannon shell Squadron Leader Gilpin flew the bomber safely to base and made a good landing. Published August 1943. Gilpin was posted to 61 Squadron flying Hampdens and later Manchesters. He completed his first tour in April 1942 after which he was rested and moved to instruction duties on Lancasters. He took part in the 1000 bomber raid on Cologne and re-joined 61 Squadron for a second tour in 1943. He completed this with 49 Squadron as Flight Commander and was posted to 5 Group HQ. He was promoted to Wing Commander at 5 Group and received a Bar to his DFC. Gilpin retired in 1946. This lovely head and shoulder photo shows him in war service dress blouse, frock white sweater and field service cap. His DFC ribbon and wing clearly visible. Very good condition. NB. the mark visible on the photo has now been removed. It is not damaged! Stock code P22478.